Check out this blog post about Hotel Endemico from one of my all-time-fav sites, Tiny House Design. 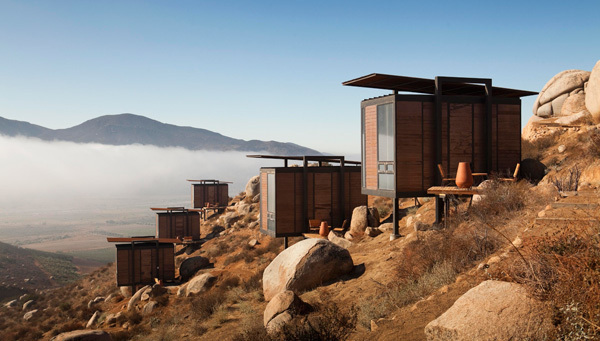 Just outside of Ensenada, Mexico, Hotel Endemico is a definitive oasis. The crisp white linens and clean architectural design make for an alluring contrast to the clay canvas backdrop that these cabanas sit upon. Beyond the unique accommodations, Endemico offers full views of its private vineyard, wine bar, lounge, and pool terrace. If you are anything like Travelerette, you just can’t wait to visit to experience the magic of this place. Take the virtual tour. I guarantee that it will be the greatest place that you have gone all day and no one in the office will even notice that you are missing.